Welcome to the Freeola Internet customer support pages. This guide is designed to help with optimising your ADSL connection, specifically your ADSL Line Synchronisation rate. For more internet help topics please visit our main Support Page. For more general tips on improving your broadband speed, please see our guide to improving internet speeds. The first and most important part of obtaining a fast connection via an ADSL connection is the quality of the line between the router and the exchange. Generally BT will provide as good a quality line to your premises as possible, whereas internal extension wiring may not be provided to as high a standard. Please note: some areas where BT have experimented with aluminium wiring or in rural areas it can be a challenge to get a good ADSL speed. BT do not take responsibility for any extension wiring within your property (even when fitted by BT except within the first year). BT's responsibility for the wiring starts at the BT Master socket (even the faceplate which plugs into the master socket is considered CPE (Customer Provided Equipment). To ensure that you are receiving as fast a speed as possible, it is good practise to have as small a mount of wiring between the router and your BT Master socket as possible. The BT master socket is usually the first socket when you enter a premises, it should have a BT logo and will usually also have a horizontal split across the middle which can be unscrewed. Underneath the bottom half of the socket you should find another telephone socket, this is known as the test socket, and this is the point at which BT take responsibility for your line. Connecting to the test socket should cut off any extension wiring allowing you to test your ADSL equipment without any interference from other equipment or wiring. If you want to see whether moving your equipment makes any difference to your speed, the first place to start is to check what is known as the sync rate of your router or modem. If you are using a router this can usually be found by logging in to your router or modem and finding the modem status section. You will usually find two numbers in this section, one is the upstream and the other is the downstream. The upstream speed controls how fast you are able to send information from your computer, the downstream is how fast you are able to receive information to your computer. The upstream on a ADSL connection will always be substantially lower than the downstream. Upstream ranges between 448kbps and 832kbps on ADSL1, this can increase up to 1000kbps on an ADSL2+ connection. Downstream can vary between 160kbps and 8128kbps, on a ADSL2+ connection, it can vary between 160kbps and 23840kbps. The downstream sync rate will change relatively quickly when you make changes to a telephone line, however the actual throughput you will receive will not change as quickly. There is another component to the speed that controls this is, called the BRAS profile. The BRAS profile is set by BT and is used to prevent your connection with becoming saturated by receiving data quicker than it can transfer it. Because ADSL sync rates can change on a day to day basis, and a profile that is set too high will cause connection problems, the BRAS profile will decrease relatively quickly if the sync rate decreases, but can take some time (up to 3 days) to increase if the sync rate increases. This also means that anything that causes the sync rate to drop even for a relatively brief period (such as static or noise on the line) will mean that the BRAS profile will not increase and will remain below the minimum speed achieved in order to keep the line stable. This means that even though a line may seem fine 99% of the time, if there are lots of errors at particular times this will keep the BRAS profile low and hence the throughput. If you think that you may fall into this category, the first thing to do is to do a BT SpeedTest (See Below). The BT SpeedTest can be done by visiting http://speedtester.bt.com, you will then be prompted to enter your telephone number and then your connection user name, once you have completed the test, you will be given 3 types of information which are of use to yourself (or support). You should be given your sync rate (as discussed earlier), your IP profile (the BRAS profile) and your throughput. These will be in descending order, so the sync rate will be the highest figure, the IP throughput will be the next highest and the throughput will be the lowest of all. The above table shows each sync rate along with the maximum IP profile that will be set for it. So for example a sync rate of 8128 (the maximum possible on standard ADSL) should have a IP profile of 7150. Electrical interference even radio broadcasts if they are on particular frequencies. Even the power adaptor on a router can cause interference (even if they appear to be working correctly). Once you have established whether the internal wiring of your premises is at fault or not you can then look into how to resolve the issue. For example if you find that connecting your broadband to the master socket gives a significant speed increase, then it is worth examining the layout of your telephone extensions to resolve the issue. 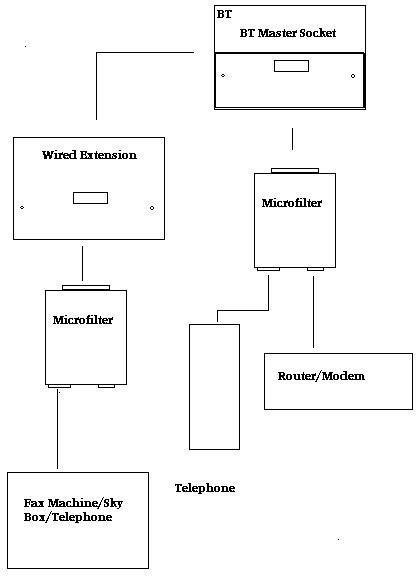 You can see a diagram of a correctly configured setup below. Note that each extension has a microfilter at the end of the line, that there are never two microfilters placed in series (this will seriously slow down a connection!) and that the router/modem is connected via the BT master socket. If your computer is not adjacent to the master socket then we would recommend either connecting the router via the master socket and then laying down Ethernet cable to your computer (the best solution, but this is not always practical) or installing a wireless router onto the master socket and then using wireless networking. A item that can improve throughput on a line is the fitting of a iPlate filter. This works by preventing the bell wire (required for old style pulse dialling phones) from creating interference on the line. This is only of use however if you have a standard BT master socket fitted and newly fitted BT master sockets usually incorporate this technology as standard. The improvements from fitting a iPlate can be quite large, typically in the range of improving a connection by 1.5Mb/s on standard ADSL lines with some improving up to 4MB/s (though there is no guarantee of any improvement). You can buy an iPlate from Freeola today! The bandwidth available to the website you are visiting. The bandwidth on the "pipe" to your BT exchange (which you will be sharing with other users). The bandwidth on your telephone line. Please note: the bandwidth delivered to you can, and most probably will, vary according to the time of day and how much other users are using. If this is the case for your connection then you may find that your connection is fast during the day, but slows down in the evening, (when home users are at their most active). Contention can be responsible for your speed slowing due to heavy usage in your area. A typical home ADSL connection will have a contention ratio of 50:1, whereas a business or premium broadband connection will have a contention ratio of 20:1. In theoretical terms the contention ratio simply means how traffic is prioritised when bandwidth is running out, the lower the contention ratio, the higher the priority your traffic is given within the network. We understand that your Broadband performance is important to you, our users, so to try and help maximise your satisfaction we do provide certain tests for you to use to analyse the quality of your line. Although we recommend the BT SpeedTest when you are providing details to our Support Team, we do also have our own quick speed test to see how fast your connection currently is. We also provide a line quality test which is useful for checking your line for excessive latency and other networking issues.